The Holsten-Galerie is located directly in the heart of the city centre and can easily be reached by public transport or car. 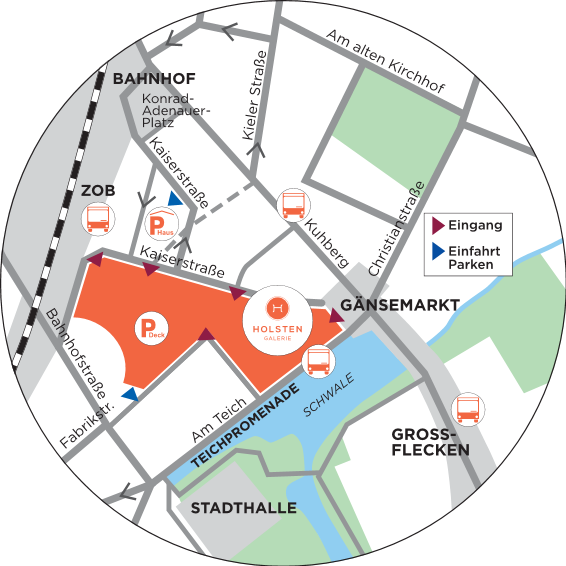 You can reach Neumünster city centre via Kuhberg and Altonaer Straße. Follow the red parking system signposts marked "Zentrum Nord“ and these will lead you directly to our multi-storey car park. You can also easily reach to the Holsten-Galerie by bicycle. There are five locations with ample cycle racks for your bicycle. The exact locations can be found on the centre map. Take the following bus lines 1, 2/22, 3/33, 4, 5, 6/66, 7, 8, 9, 12, 14, 16, 77 to HBF/ZOB.